Rogue Amoeba has released SoundSource 4, a major upgrade for the sound utility with new features and a redesigned interface. While the previous version was handy for accessing your Mac’s speakers and microphones and switching among sources, SoundSource 4 now provides finely grained controls that enable you to route audio output and levels on a per-application basis. That enables you to, for instance, play music on an external speaker loudly while keeping other audio on your Mac speakers to a minimum. SoundSource also now includes a 10-band equalizer with nearly two dozen presets and a Magic Boost option, which can crank up quiet audio to produce richer, fuller sound. 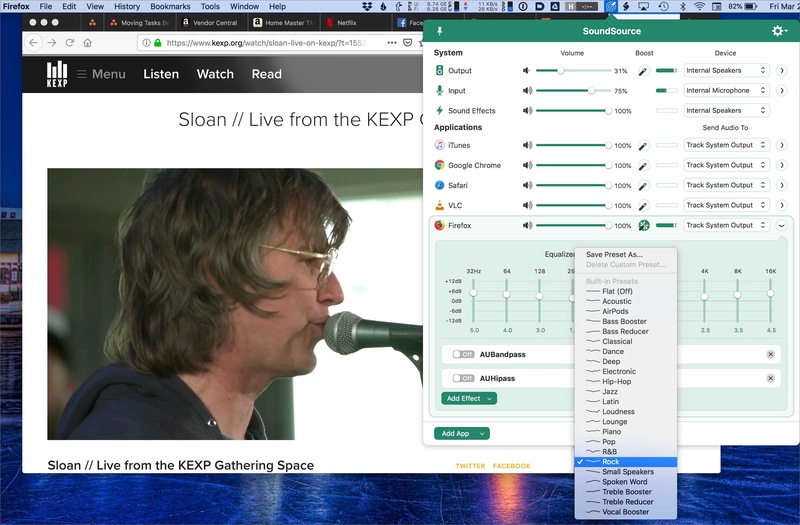 Other new features include full keyboard controls and a global hotkey for opening the app, the capability to float the SoundSource palette as its own window (so you can drag it to a different part of your screen), and Audio Unit effects for creating complex audio adjustments. Shortly after the release of version 4.0, Rogue Amoeba issued version 4.0.1 to address several rare crashes, resolve an issue where the app would incorrectly apply multiple volume adjustments to input devices, and fix bugs with displaying on multiple-monitor setups.